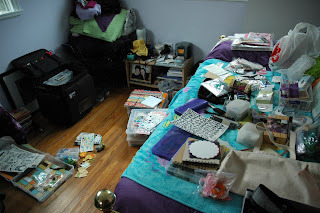 I thought some might be amused to see what my room looked like as I was packing my scrap stuff up. Dan decided that it looked like a scrap store threw up in it. Kristi, Sandy, Misty and I rented a purple SUV and drove to Bradley, California. Our fearless driver Kristi got us there at 11pm on Thursday. Kelly, Cathy, Amy, Raquel and Jen were already scrapping when we arrived. Friday we all decided it would be fun to have an outing so we drove, in two cars, to Paso Robles. 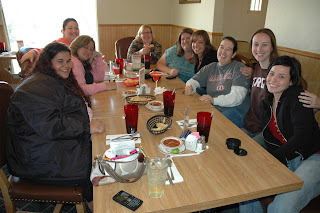 We stopped at Walmart for our scrapbook shopping fix and then had lunch at the Mexican restaurant Lolo's. We met a lot of pleasant locals and enjoyed the company. We had a great waiter named Justin too! Then we went back to the house to scrap for many hours. I goofed off a lot, as did several other girls. I am so happy I was able to meet so many of my online friends! 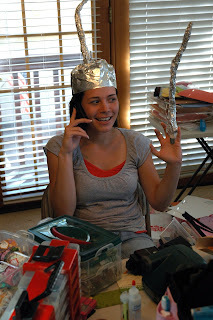 No one had cell phone reception but Sandy was determined to find a signal. I love this girl! She had me laughing so hard this whole weekend. I am uploading a ton of photos to flickr. To see the rest of our weekend, click here. 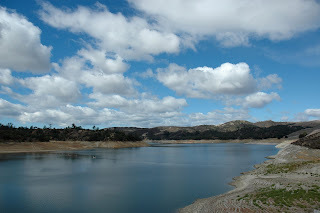 The beautiful Lake Nacimiento that we stayed near. On Saturday Kelly, Cathy, Kristi and I decided to drive back into town to go to Michael's and the dollar tree. I was hoping to find some thickers that Jessica said she found there but I had no luck. 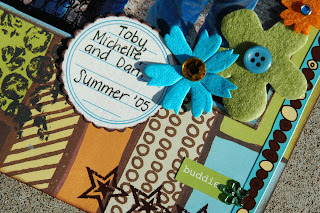 Then we went back to scrapbooking. We had a great time! If I was to recap every moment this blog would be a five pager so I'll keep the stories short. I did get a seven layouts done but I can't show them just yet. Here are some teasers. I had the pleasure of having Misty stay at my house Sunday night since her flight to Alabama was for Monday afternoon. We were supposed to meet her friends Katy and Travis at Pier 39 but they got stuck in traffic and couldn't make it. 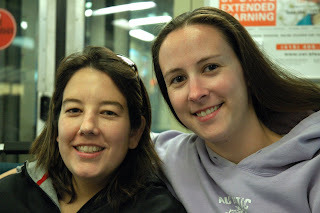 Dan, Misty and I decided to take BART and then MUNI to Pier 39 anyway. There was a group of sailors playing music that made for a fun atmosphere. 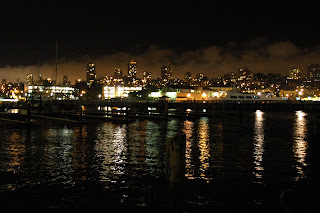 We ate dinner at the Pier Market and then went to see the sea lions. I saw some adorable skull knee socks but they were sold out. I was so sad! 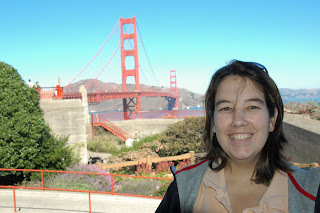 I took Misty to see the Golden Gate Bridge and take a few photos. I love to pretend that I am a tourist! I can't wait until Misty and Wes can come back and visit! omg that pic of Sandy is hillarious! Misty looks photoshopped into that pic, I love it. 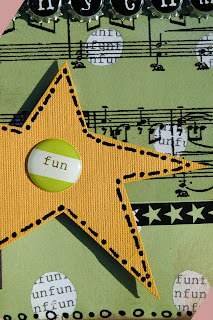 You did a fabulous job on your layouts this weekend! I had a blast as well! omigosh - those sneaks look awesome!!! I can't wait to see what you did! Thanks for being such a great hostess. I've just posted a new blog with my dramatic flight experience. I had a blast. It was great meeting everyone. I look forward to the next Whore adventure. 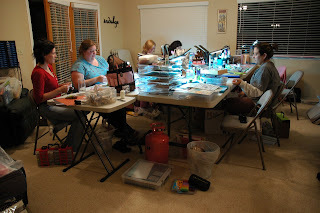 omigosh....looks like so much fun...=) wish I lived closer!! 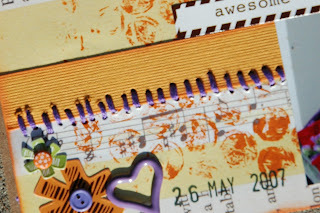 he he..and I can't wait to see your pages....!! Sounds and looks like you guys had a blast! Can't wait to see the whole layouts!! They look like they will be awesome! 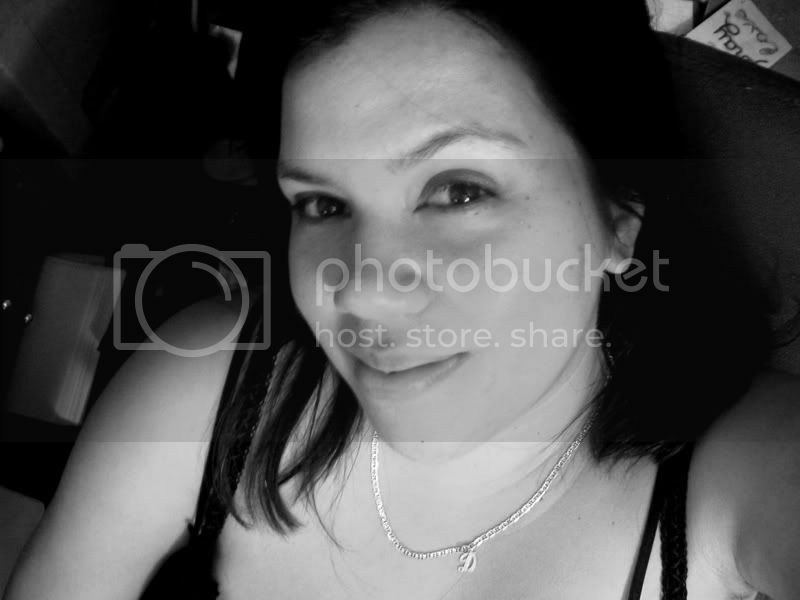 Those pics are very fun! Glad you had fun!